The 52 acres of wild Robinsonian botanic gardens lie by the ruins of a Queen Anne style house. Expansion of the gardens began in 1712 with rapid growth occurring in 19th century with the planting of rare trees and shrubs. Today the wild landscape is free to explore. Amenities: There is a café on site, toilets and parking. Wheelchair access is available to most areas but there are some steps and steep inclines to be avoided. Opening hours and costs: The site is FREE to visit and open daily from 9am-6pm. Originally the site of a medieval castle, Viscount Powerscourt in 1790 decided to transform the building into a mansion with 68 rooms. The walls of the main house boast stonework dating back to the 13th century. Powerscourt Waterfall is the highest waterfall in Ireland and is located on the grounds, there are also guided tours and walking trails available to visitors. Amenities: There is full wheelchair access and a café on site, with toilets and a gift shop. Opening hours and costs: The site is open from 9.30am-5.30pm daily and entry is priced at €10 per adult, €8.50 for students/seniors, children €5, family ticket €25. Children under five are FREE. Built between 1741 and 1750, this house was constructed by the wealthy brewer Joseph Leeson. Visitors can take a tour of the house to discover 300 years of architecture, art and interior design as well as enjoying views of the Blessington lakes and Wicklow mountains. There are parklands and walking trails as well as a the national bird of prey centre, a walled garden and maze on site. Amenities: There is a café and gift shop on site and a children’s playground. Wheelchair users can access all areas of the house except for the bedroom floors. Opening hours and costs: The grounds are open daily from 10am-6pm with the last tour at 5pm. Prices are €12 per adult, €9 per senior/student, €6 per child and €30 per family. The valley at Glendalough was carved out by glaciers during the Ice Age and in the sixth century St Kevin founded monastic sites here. 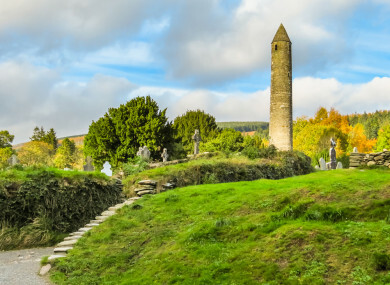 In the national park, there are round towers and remains from the mines of Glendalough and Glendasan. Visitors are free to walk, cycle or hike the trails and guided tours can be booked in the visitor centre. Amenities: There are cafés, toilets and parking available. The site is partially wheelchair user friendly, aside from the steep terrain on some trails. Opening hours and costs: The site is FREE to access but costs for parking apply. The restored historical site here invites visitors to experience the harsh and cruel history dating from the 1798 rebellion to the early 1900s when the jail was in operation. Visitors can take a guided tour from a guide dressed in character, and hear stories of prison life in past times. There is also a genealogy and archives service where visitors can search for their ancestors. Amenities: There is a gift shop, café and restaurant on site as well as parking facilities. There is no wheelchair access to the tour. Opening hours and costs: The gaol is open daily from 10.30am-4.30pm. Prices are €8 per adult, €6.70 per student/senior, €5 per child and €22 per family. Thanks to Wicklow County Council heritage office for recommendations. TOMORROW: Top 5 must-sees in Limerick and Dublin cities. Email “Your summer in Ireland: 5 must-see sites in Wicklow”. Feedback on “Your summer in Ireland: 5 must-see sites in Wicklow”.